Freckle Milk Chocolate Delivery in Sydney! 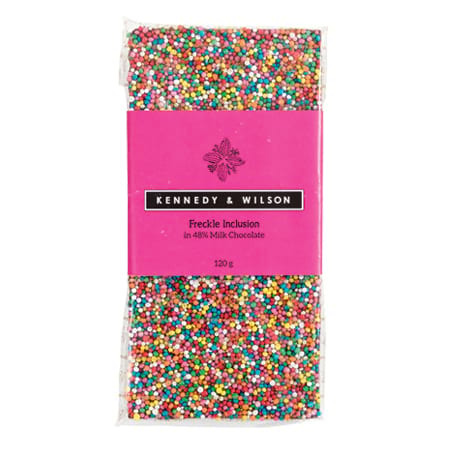 Our sublime Kennedy & Wilson freckle milk chocolate bar is super scrumptious. This 120g freckle inclusion bar is a beautiful blend of 48% milk chocolate for a creamy cacao sweet treat from heaven! Handmade in Victoria`s Yarra Valley, this divine chocolate bar uses premium quality cocoa and cocoa butter sourced from around the world. If you want to spoil someone who adores quality chocolate, this freckle bar is just the thing! Order your chocolate delivery just as is, or team with a bunch of flowers, a fun balloon or even a bottle of bubbles! Order your chocolate delivered Sydney wide via our website or give the team a call on 1800 66 66 46.